Is there a special little one celebrating his/her first birthday? 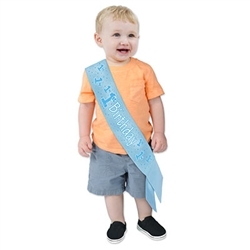 This blue 1st Birthday Satin Sash is a great party accessory to commemorate the special day. The package includes one blue satin sash measuring 2 3/4 inches by 19 1/4 inches, as well as a hook and loop fastener. While the sash would obviously look great on your son or daughter, you could always order a second one and hang it on the wall or use it to decorate the table. Comes one sash per package. Happy 1st birthday!